Throughout The Cascadia Advocate’s now fifteen plus years of existence, we have always tried to make its content as accessible as possible. For example, we’ve always offered the full text of the most recent posts through our RSS feed. And when Facebook and Twitter came along a few years later, we made it possible to discover content from this blog through those social media platforms. Today, we’re happy to announce that The Cascadia Advocate is available through Apple News. If you’re an iOS, watchOS, or macOS Mojave user, you can now read our latest posts from within Apple’s News app. Pretty cool! To ensure The Cascadia Advocate appears in your list of favorite news sources, do a search for “Cascadia Advocate” in Apple News and tap the heart-shaped Love button to make it one of your favorites. What we like the most about Apple News is that it provides a superb reading experience, especially on mobile, where content is optimized for both the iPhone and the iPad. Apple News also makes it easy to keep reading after you’ve finished a post by showing you other recent and related posts we’ve published. We also appreciate that Apple News is not a vehicle for data collection like apps from other big technology companies we could name. Apple News was originally introduced for iOS in September of 2015. Late last year, it became available on Macs with the release of macOS Mojave. Last week, during a glitzy event at the Steve Jobs Theater, Apple announced an enhanced version of Apple News, News+, which includes subscriptions to a number of magazines and newspapers (although not necessarily unfettered access to all the content published by those magazines and newspapers) for $9.99 a month. The Cascadia Advocate is available through the regular Apple News app and does not require a subscription to News+ to enjoy. 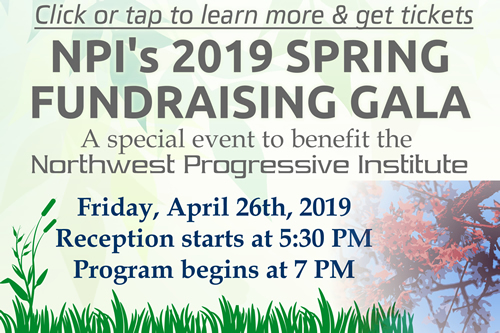 Although there is no paywall, if you want to sustain our research-driven advocacy and keep the analysis and commentary flowing, we do invite you to become a member of the Northwest Progressive Institute. You can donate monthly or weekly at a level you choose.